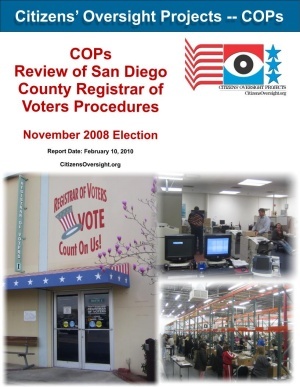 Thank you for completing our form for your "free" copy of our extensive research on the operation of the San Diego County Registrar of Voters. Click on the image to download a free copy to your computer. Please refer others to the following link for their copy of the report. The file is a Portable Document Format (PDF) and requires a viewer. You can obtain a viewer from http://www.adobe.com if you do not already have a viewer installed. <-- Click here to donate! Enter any amount you wish. Please note, all donations are now tax deductible.